I haven’t quite explored all of the hidden gems Ivy City has to offer. 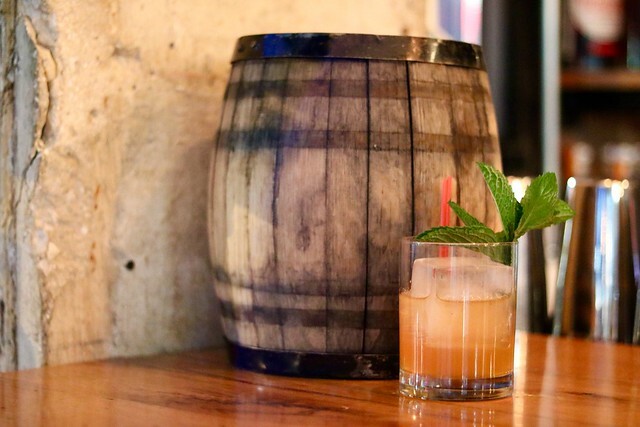 Unless you live under a rock, you know the craft cocktail and distillery scene is exploding in the nation’s capital. As my time here comes to a close, I’ve made it my mission to cross off everything on my D.C. bucket list. And a visit to Republic Restoratives was on high on the list. 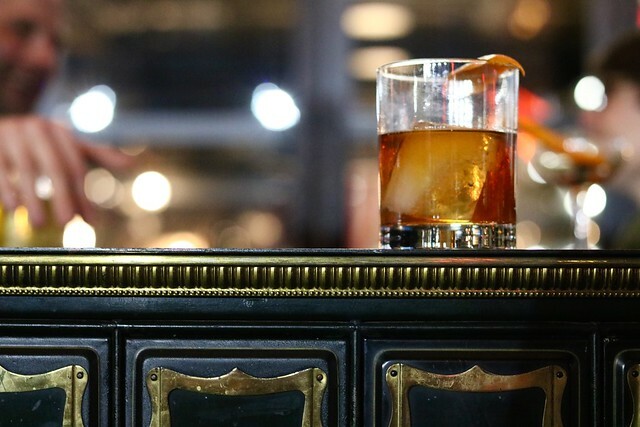 Republic Restoratives is a distillery in Ivy City focused on producing vodka, bourbon, and—most recently—rye whiskey. Co-owners Pia Carusone and Rachel Gardner created the small batch distillery and cocktail bar. It’s worth noting that Republic Restoratives is the only women-owned distillery in the city! As another women-led business, that’s a concept we can get behind. Carusone and Gardner have been friends since their childhood days in upstate New York. While Carusone’s impressive background includes politics and media, Gardner embarked on a career in sustainable natural resource development. But bourbon was always present throughout their friendship. Eventually, they decided it was time to turn their ideas into action: the girl bosses leveraged a crowd-sourcing page to kick start the distillery, making Republic Restoratives the largest rewards-based crowdfunded distillery in the country. Unlike most distilleries, Republic Restoratives offers a cocktail bar instead of a simple tasting room. Sunlight peeks through the glass windows, brightening up the space. 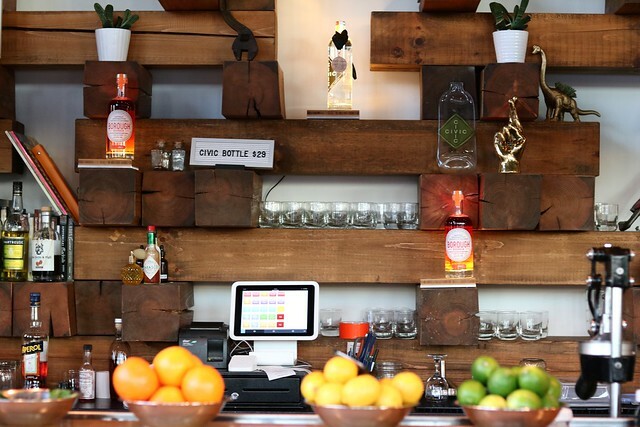 An eclectic assortment of knick knacks are on display on the Jenga-style wooden stacks behind the bar: quirky tools, potted plants, and gold dinosaur terrariums. The cocktail bar is warm, friendly, and playful. A large, glass garage door provides a glimpse into the adjacent distillery. I had brought my nearest and dearest friend, Manisha, with me for this tasting experience. We began with a short, but informative, tour around the distillery. We were also given the rare opportunity to try the crisp and clean Civic Vodka while it was still in the distillation process. 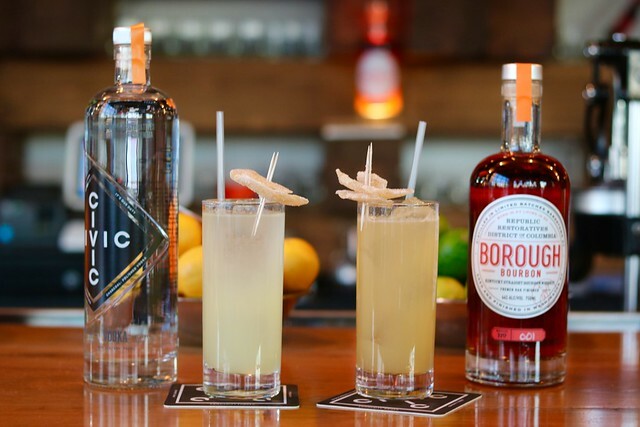 The distillery tour and tasting is a fun, ideal post-brunch weekend activity. Meanwhile, as the cocktail bar is more intimate, we recommend bringing a date or a small group of friends. Republic Restoratives offers a rotating cocktail menu with the spirits. 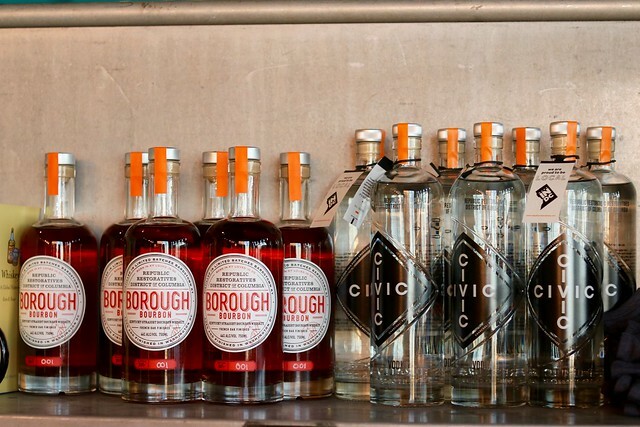 The spirits include Civic Vodka, produced from American corn and is inspired by community and people. Meanwhile, the aged Borough Bourbon focuses more on places. 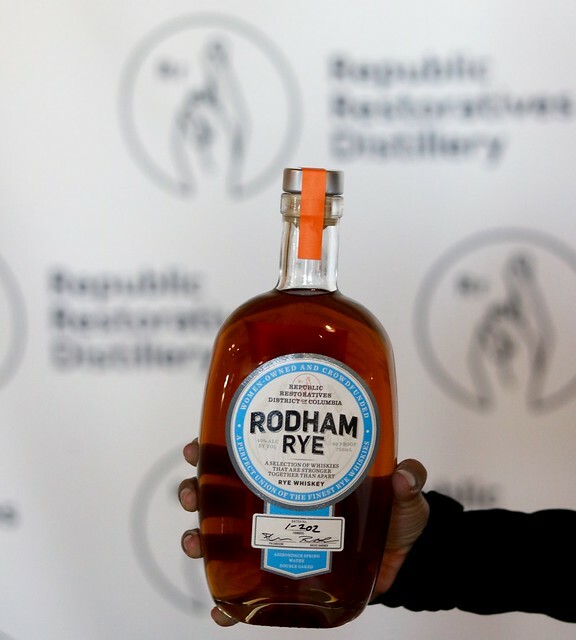 The distillery recently added the Rodham Rye Whiskey inspired by the ultimate girl boss, Hillary Rodham Clinton. As someone who can’t resist a killer Moscow mule, the Kentucky mule was my first order. With aged bourbon as the base instead of vodka, the bright orange cocktail was satisfying to say the least. Manisha opted for the traditional Moscow mule made with the Civic Vodka. The cocktails were adorned with ginger candy. These mules were some of the best we’ve had to date. We really loved the use of lime, simple syrup, and fresh pressed ginger, rather than ginger beer. Doug and John, the lovely bartenders and cocktail masters, had a few recommendations for us. They prepared the Civic Smash for me next. The cocktail is similar to a mojito, but with vodka in the place of rum. The cocktail also had Aperol, mint, and lemon. Manisha decided to try a cocktail with bourbon next; and Doug created a play on a classic Old Fashioned for her. The Talent Scout cocktail incorporated orange Curacao to sweeten against the angostura bitters. She absolutely loved this cocktail as intro to get further into her new affinity for whiskey. Lastly we ended evening with the left hand cocktail. 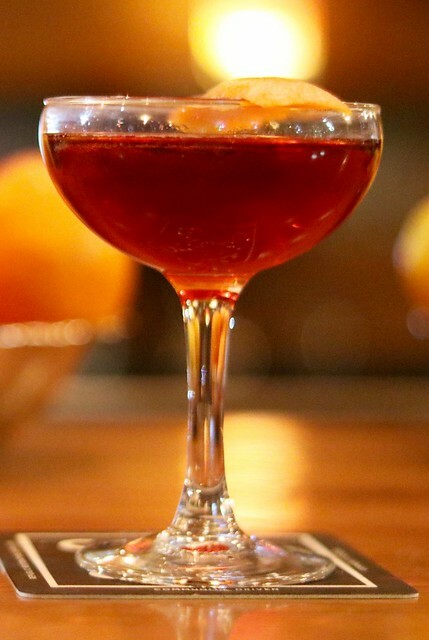 Vermouth, Campari, and chocolate bitters along with bourbon made for a rather aggressive end to a Thursday night. While the cocktail was delicious, it was a little too strong for our taste buds to be able to consume all of it. Cheers! Republic Restoratives is a fantastic hidden spot in the heart of Ivy City among the other distilleries. 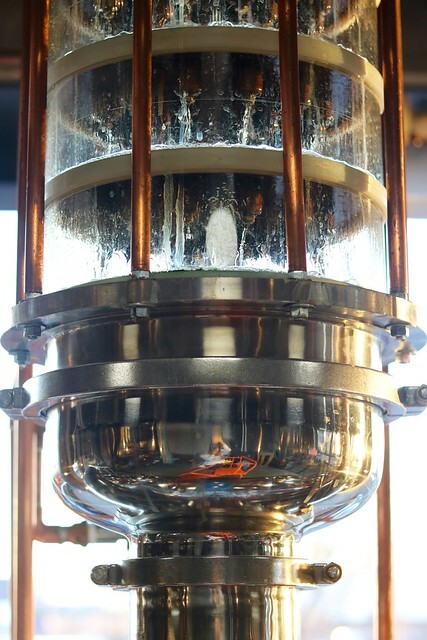 We especially love that it’s not just a distillery, but also a craft cocktail bar. There’s something to be said about being able to enjoy fresh cocktails prepared with the very spirits created there.